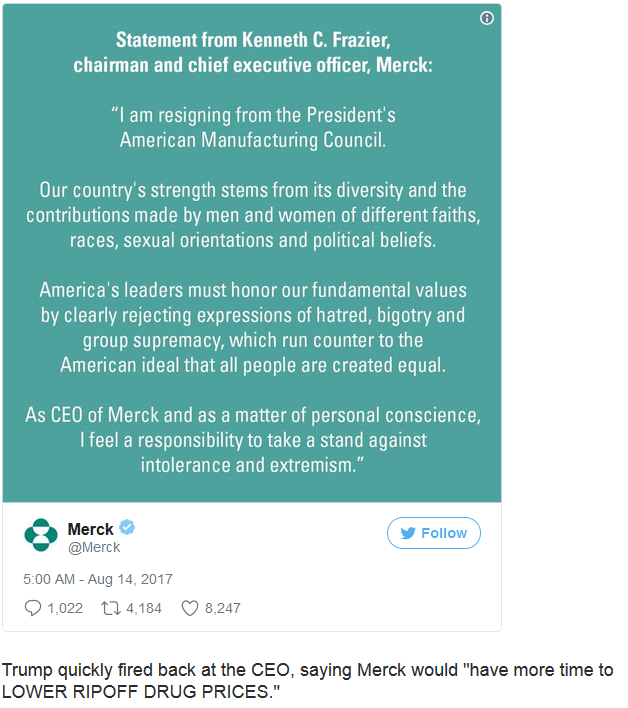 An African-American CEO of a major pharmaceutical company has resigned from a presidential council in a direct response to President Trump’s remarks about “many sides” being to blame for violence over the weekend in Charlottesville. 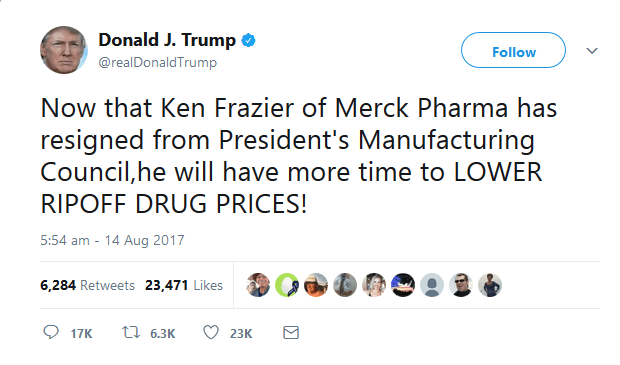 “Our country’s strength stems from its diversity and the contributions made by men and women of different faiths, races, sexual orientations and political beliefs,” Frazier said in a statement that did not mention Trump by name. Frazier previously served as the chairman of a commission that investigated the pedophilia scandal at Penn State University. The commission’s report found that Penn State administrators failed to take action to stop Gerry Sandusky, a football coach convicted of sexual abuse. Trump faced backlash this weekend for denouncing the violence in Virginia but not directly putting blame on any particular group. “We condemn in the strongest possible terms this egregious display of hatred, bigotry and violence on many sides — on many sides,” Trump said at a press conference from his New Jersey golf course. The White House on Sunday sought to clarify Trump’s position.